I found these two books from Bahrain for the Read The World challenge, and I bought both because I thought they might offer an interesting contrast. The Gulf states seem like a fascinating part of the world at the moment, but the rule I set myself — that books should ideally be by people who are actually from the relevant countries — is not helping. These are tiny countries with small publishing industries that do not translate a lot into English; and they have some pretty autocratic governments that probably restrict the kinds of things that can be published at all. So if I want to find books that address the full weirdness of the Gulf — the pouring of unimaginable amounts of money into international sport; the way that Dubai manages to be an autocratic Islamic state while also a favoured holiday destination of European playboys; the fact that Qatar has a population of 1.8 million, of whom only 278,000 are citizens; the planned outposts of the Guggenheim and the Louvre; the… ambiguous position of Saudi Arabia in the War on Terror — well, I’m probably going to have to look for something written by an outsider. Vidya Samson is an outsider, and does provide an interesting perspective, although not the kind of perspective that would offer insight into, say, Qatar’s winning bid for the 2022 FIFA World Cup. Bras, Boys, and Blunders: Juliet & Romeo in Bahrain is a teen romantic comedy about an Indian girl going to a multicultural Catholic school while her parents are working in Bahrain. At the school, white students have automatic cool status while the Indians and Pakistanis are at the bottom of the pecking order, mocked by the Arabs for their accents. Our heroine is a naive, shy girl dealing with boys, flat-chestedness, her parents; it’s fairly standard stuff, apart from the unusual setting. I’m clearly not the target market for this book, but it was likeable enough. When I was reading the first story, I seriously doubted that I would make it through the whole book, but actually I found if I read it quickly, and tried not to get hung up on individual sentences, it wasn’t too bad. The more straightforward the story, the better it worked; anything too poetic or ambiguous was much more difficult. A badly translated stream of consciousness is hard going. Still, prose style aside, reading the stories for their content was interesting. For example, love stories are interesting in a culture where contact between men and women is restricted; there are stories about extreme poverty; there were several stories about divorce. Of course I knew that it was very easy for men to divorce their wives under Islamic law, but I’d never really thought about how brutal it could be for the wives and children, that men could just set them aside and move on to new women. Which is a failure of empathy on my part, admittedly. So I ended up enjoying it more than I expected, at least. 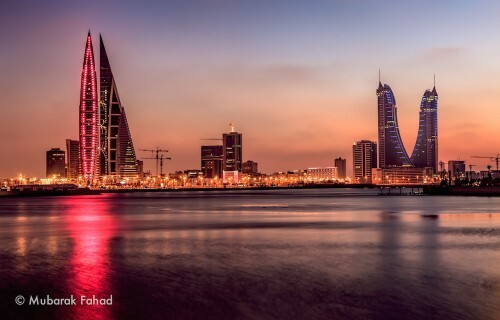 » Bahrain Cityscape is © Mubarak Fahad and used under a CC by-nc-nd licence. Protests in Bahrain is © Al Jazeera English and used under a CC by-sa licence.